After years of very thin pickings, the Barbican has recently acquired not one but two classy gastropubs. This, and the Chiswell Street Dining Rooms (opened in 2011) are both part of Ed and Tom Martin’s ten-strong empire. The Jugged Hare was once called the King’s Head; it’s been handsomely remodelled, with a lovely oak floor, red leather seating and more than a scattering of stuffed and mounted animals. 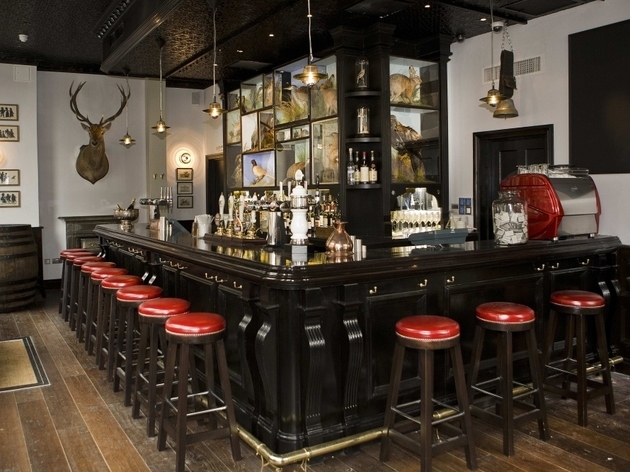 The bar is an idealised version of an old drinking haunt; pints of real ale (four on draught) are downed at tables fashioned from antique whisky barrels. Bar snacks are a cut-above: chips and gravy; pork crackling with apple sauce; venison scotch egg with Cumberland sauce. There’s a bar menu in the same vein. Vegetarians will have got the message by this point. Meat rules, with just one veggie dish of the day, though there’s plenty of seafood on the dining room menu (prettiest item: poached langoustine worthy of a still life painting). Game is a feature; a perfectly cooked wood pigeon (from the rotisserie) was helped to star status by accompanying lentils with dripping. Also good was a super-size wild boar and venison sausage, which we paired with a sprightly beetroot and fennel slaw. The kitchen can do delicate too – a salad of spring pea, broad bean, radish, dandelion, goat’s curd and walnut made a refreshing starter only marred by bullet-like peas, while lemon junket with blood orange jelly was a dreamy finish. Dishes come from an open kitchen, a space that adds warmth and light to an already appealing dining room. A lot of warmth comes from the staff too: all well drilled, enthusiastic and knowledgeable about the menu and wine list. And there’s a lot to know about the latter: there are wines by the glass from a wine preservation system, monthly wine flights (this month has three 50ml measures of pinot noir in white, red and sparkling variations for £9), a producer of the month and, overall, an emphasis on small independent vineyards. Not everything here works perfectly yet – there’s a fetish for serving food in containers (tins, ceramic pots, kilner jars) that seems fussy, especially as many dishes then need decanting for ease of eating. A bitter, slightly burnt coffee and dull white bread were our only other grumbles. But overall, there’s a great sense of pride and attention to detail – nicely epitomised by the bespoke Jugged Hare bottled pale ale, commissioned from Sambrook’s Brewery. The Jugged Hare features a 'theatre' kitchen with a state-of-the art eight-spit rotisserie and a charcoal grill. Spit-roast meats, seasonal British game, wild fish and shellfish are on offer on a daily basis. One of the best roasts in london! I had the mutton! Deliciously tender meats with incredible roasted potatoes, carrots and cauliflower and cheese. The desserts weren’t too shabby either. Great service and lovely decor! If you’re looking for a solid Sunday Roast that will have you bursting at the (very satisfied) seams, then don’t look further than The Jugged Hare. Finding the ultimate Sunday Roast in London is always tricky, some people are very specific with how they like their roast and it’s no surprise, it’s serious business. The Jugged Hare is a little out of the way, but the food their has always been on point. I’m always looking out for restaurants who have the nose to tail philosophy so I was very happy to see that they had pig’s ear crisps on the menu - and the were tasty. I understand how the concept can worry some and but don’t be alarmed - it’s just pork crackling so do give them a try! The Haggis scotch egg was lovely golden yellow and a little runny - just the way I like them, and they were served with a delicious chutney that helped cut through the heaviness in the haggis. The rump roast was simply delicious - tender, perfectly medium rare and the horseradish cream wasn’t overpowering. The yorkshire pudding was nice and light and helped soak up the generous amount of gravy (I hate it when they’re stingy with the gravy!). The sides also really held their own, with the almost sinful duck fat roast potatoes and the creamy cauliflower gratin. The roast chicken with a side of Caesar salad is very well proportioned and the chicken was succulent and the salad not drenched in dressing. Together with a pretty solid wine list, you really can’t go wrong here at The Jugged Hare and I wouldn’t hesitate putting this at the top of my Sunday Roast list. Tip: always have a booking as they can get quite busy and if you’re there for a Sunday roast, try and not eat too late in the day as they do sell out. Good For: large groups, drinks, casual lunch/ dinner/ drinks, catch up with friends, Sunday roast, date night, special occasions. This is a smart looking bar at the front with an attractive bright restaurant at the back. It was very busy at 5.30pm on a Tuesday when we were there, we would not have found a seat in the bar, but luckily we had a table booked in the restaurant. As you might expect from the name, the menu is very meat orientated, indeed, the only vegetarian main course is listed as "vegetarian" with no description - just a price. We had the devilled plaice while we discussed the menu, nicely crisp but hardly any spiciness. There are two types of hamburger, the waiter was quite specific in asking which one we wanted, so we had one of each but were not able to find much difference between them. They are quite expensive, but very substantial, both people who ordered them left half. I had the pork belly, which was unlike any pork belly I had had before, it was like a huge pork chop. However it was very good and I forgot to enquire after. The "vegetarian" dish was reportedly "fine". The hamburgers and the pork were all served on flat wooden boards, I thought these had gone out of fashion years ago, and they are totally impractical for a dish served with gravy. The wine list has plenty of choice, if a bit pricey for the quality. The service was excellent and it is very handy for the Barbican. Spot on service and.top to bottom brilliant food. Come on a Sunday with an empty stomach and expect to leave with a food baby. 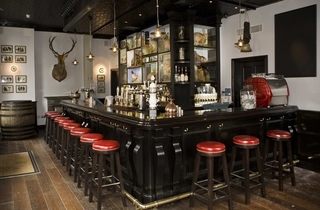 This upscale gastro pub decorated with all manner of game taxidermy knows how to do a good roast. Try to book a table because it can get busy with small families and groups. We had to sit at the bar and while it was interesting to see the chefs work, it did get pretty hot. You cannot go wrong with their Sunday roast chicken. The half roast rotisserie chicken with sage stuffing was incredibly succulent and the golden crispy skin did not disappoint. It came with all the works: Yorkshire pudding, duck fat roast potatoes, seasonal vegetables of perfectly cooked carrots and cabbage, gravy and bread sauce and the most delectable macaroni cheese. All for just £18.50! It was well worth it and staff were really polite and helpful. My go to place after a performance at the barbican. Lively, great selection of beer and wine and lively crowd and staff. The pub food are great to share with friends and they even impressed my vegetarian friends. the restaurant serves a great roast and fantastic menu of game during autumn/winter - so it is a great time to go now - and it is one of the places to eat them in London. I am looking forward to go this year after an amazing 2014 game menu. I've only ever eaten the roast lunch here so can't comment on their evening or a la carte fare but if they are a patch on the Yorkshire pudding & all the trimmings Sunday food fest then they must be good! It's a great space which is both laid back & relaxed but still has a buzz. The staff are really friendly, attentive & efficient. You never feel rushed & every time I've dined here it has morphed into a long lazy lunch over great food & fine wine. The presentation is excellent & everything is delicious. It's pricey but the quality makes it worth the splurge. I had dinner here after an exhibition at the Barbican and it's a great spot. The atmosphere in the pub is very lively and the dining room has a great buzz, too. There was a good selection of game and other British autumn specialties. Although there were a few faults with the side dishes of our dinner, the actual mallard and grouse mains were great and the service more than made up for the criticism we had for our food. Definitely worth a visit if you're in the area. Book ahead for dinner! We booked ahead (by 15 mins...) and the staff could not have been more welcoming or attentive. Great atmosphere in the dining room and the open kitchen makes the experience. Our rib eye steaks were perfectLy cooked, although not sure quite deserving of the £32 price tag. One of my friends ordered the fish which was lovely, and all sides were spot on. We will come back! We had our company AGM here in the Josephine room with 30 people and it was perfect. The food and service were great and the organisation by Briony with such short notice was excellent. We would definitely recommend this venue and we will use again in future. Hosted a conference reception for 40 people with wine and the Bowl Food Menu in the Josephine Dining Room. The food was perfect, the wine selection excellent, and the staff was friendly, helpful, and efficient both on the night and throughout the booking process. I would definitely use the Jugged Hare for another event! I recently arranged an afternoon catchup with a group of friends who hadn't seen each other in months. With everyone being 'foodies' we wanted a long, lazy lunch of fabulous food and lovely wine. We were not disappointed on all fronts. From my initial email to Briony I was immediately put at ease as she was super responsive and very amenable to providing us with just the type of afternoon we needed. All the staff across the board were incredible. Our waiter in particular was exceptionally helpful and knowledgable. We had such a wonderful afternoon. The food was delicious, and I will be back again - whether it be for a larger group like ours, or a table for two, I couldn't recommend it enough. We had an office awards evening in the private room at Jugged Hare and it was fab. Briony was super attentive and responsive from the moment I sent the first email and the service on the night was fantastic! We had 4 chaps around who were serving drinks, food and hanging our coats. Lovely lovely room and food, wine and beer was all perfect! Excellent place for a private event. I had my 25th birthday at the Jugged Hare last weekend and it was great. The events team were really helpful, and made sure that all the information was passed on to the relevant people. The staff on the day were very polite, attentive and quick. The whole thing went off without a hitch. And the food is great. Couldn't recommend it highly enough for anyone looking for a great Sunday lunch / party. I celebrated a 40th birthday last Saturday and it was absolutely superb. The staff was wonderful - responsive, quick, attentive. Everything went according to plan and guests were delighted with the food. I had a lot of decorations, music and extra requests I had placed. All of them were answered and in place. It was easy, smooth, fun and the dinner remained intimate even if we had 24 people around the table! Overall, an excellent night, great service, superb food! A special thanks to Briony who was in charge of looking after every detail and communicating it to Yanni and the rest of the staff! We recently held our office Chrismas celebration dinner in one of the Private Dining Rooms at the Jugged Hare. I found them very helpful throughout the lead up to the event. On the night itself the room setup was lovely and the staff were very attentive. The food was amazing and I received lots of feedback from our staff on the food also to say how much they enjoyed it. Overall the atmosphere of the venue was great, excellent service and delicious food. Would definitely recommend. I organised a wine matching dinner for a very valued client here this week. Throughout the whole process since booking several months before I could not fault the attention to detail by the team, especially Briony who personally took care of my booking. On the night we were well looked after, especially since my event required specific service of the specialist wines I provided for the dinner. Nothing was too much trouble, the venison main course was exceptional, so tender and juicy. My client was very happy with everything and he had excellent feedback from his guests too. The Josephine room is a perfect size for a seated group of 30 to 40 and with its own small cloakroom, which guests especially appreciate in terms of privacy and security. I would definitely recommend and use for other events in the future. Saw this pub/restaurant on tv programme and looked quite good so went there to give it a go. Just got back from the restaurant, I m so disappointed with the food and the service. Firstly, the lady at the desk wasn't so welcoming. Secondly, we ordered still water and diet coke, came with sparkling water and coke. That's fine. The bread was good. We tried the roast beef and roast mutton. Honestly, I haven't tried anything this bad before, the meat doesn't taste like beef, I don't even know what kind of meat is that to be fair but I have been told is beef. Meat were very chewy and we couldn't even cut the meat probably with the knife. Maybe was the cut of the meat but the meat was tasteless and vegetables were undercooked. I m certainly not coming back with the price that they charged for. Finally, we have been told they would like the table back by 2pm, which was fine with us. We got 1 hour and 45 mins but we didn't even asked for the bill and the bill turned up on the table at 1:30. I didn't know I went to China town for lunch. Just wanted to share my experience. I had my 40th birthday party at the Jugged Hare in the Josephine room and it was fabulous! The event was organised very efficiently by Briony and the staff on the night were terrific, couldn't fault it! Delicious food, very attentive staff and the venue was perfect. Thank you for making it such a terrific night and I am sure, many of my guests will be back for more! Organised an event for 50+ people in the delightful downstairs Josephine Room. Event and waiting staff were terrific - nothing was too much trouble. Food and drink were excellent quality and the price point was very good. Unlikely many dull city/city fringe venues The Jugged Hare has personality and delivered on all aspects. Highly recommended. Held an event at the Jugged Hare this week. It went very well, the events manager did a great a job in organising things exactly how I wanted them and the evening went very well, my guests enjoyed themselves. The food was very good and the service was attentive. Would definitely go back. I dined with my partner at the Jugged hare last Monday. The restaurant staff were very attentive, genuinely interested and cannot be faulted. I had the wild boar terrine as a starter. I think it was too fresh from the fridge - completely tasteless, and the Melba toast was toasted far, far too much - it was like wood. My main was the haunch of fallow deer. This was served lukewarm, bloody and completely undercooked. I complained and it was taken away to be re-presented ten minutes later - warm, undercooked and bloody. I complained again and was told that this was 'how we serve it', Unacceptable, especially at £22, Why not ask, as you would with a steak, how the customer would like it? It's not rocket science. Very disappointed. My partner had the walnut salad which she hugely enjoyed and then the duck which was dripping blood, and very disappointing. I will never eat here again. 23 November, Saturday. Lunch for four. Longhorn hamburger ordered medium well and served uncooked-to-rare in the bulk of the meat. I asked to send back to kitchen. Blonde female manager asked was there problem to which I showed her the meat was uncooked. Burger goes back to kitchen and several minutes later a new burger with a portion of the first burger is re-served and the new burger is also uncooked-to-rare through. So this went back to the kitchen without a further order for alternate entree. Colleagues had the Roe deer sausages which a tasting of revealed to be dried out and chewy. We asked for the bill to be split in two with the wine to be put on our bill. Our invoice arrived with additional items including not two but three bottles of wine, a caesar salad never order and two (2) pints of ale. Our colleagues bill had similar "errors" to which we applied a sharp pencil and asked for the correction. The food was poor to fair and items not ordered were added mysteriously to our bills. Not interested in returning nor recommending to others this eatery. We dropped in for a snack, and had just starters and a glass of wine at the counter by the kitchen. Delicious wild boar terrine and good wines, and we were made to feel very welcome even though the restaurant and pub were heaving. Not cheap, but definitely worth it for the quality and friendly vibe. I still miss the King's Head, but this is very nice, and the interior is absolutely lovely. I had dinner with a friend at The Jugged Hare for the first time last Thursday. The menu was excellent: superb seasonal fayre at appropriate pricing for the environs. The service was attentive; the staff were knowledgable and welcoming. I liked the décor of the dining room, part of the former Chiswell Street Brewery, which was festooned with taxidermy. I liked the buzz from the bar, which was far enough away to be unobtrusive but loud enough to enhance the dining experience. All in all, a welcome find in an area packed with unexpected pleasures. Read some poor reviews below, so was wary. Good service. Child's main came with our starters as ordered. Staff attentive but not intrusive. Excellent aged steak with real depth of flavour. One of the best we've had in London. Haunch of venison nice, thought small portion and no sides for £21 which is pushing it for lunch. We'd go again. Wine recommendation spot on and under £30. Also 10 children in restaurant. All well behaved. Who said the Brits can't dine out as a family without carnage and chaos. Deservedly busy at mid week lunchtime with a lively atmosphere, good timely service, very good food at £100 for two inc. wine. I would suggest booking in advance as seems very popular. Came here with friends over the weekend. Nothing special at all. Wouldn't return. Most of our food was either dry or chewy. Nice, lively atmosphere however. One of the best meals I've had out in London in a long time. Fresh, delicate lobster salad, followed by a juicy t-bone veal steak with chips, bearnaise and gravy, all punctuated by a delicious 'burnt chocolate' cream. My girlfriend's choices were equally outstanding. Service was impeccable. Nibbles, a couple of side dishes and several drinks each helped furnish a rather chunky bill, but it was worth every penny. Great atmosphere, fun decor, friendly service. Bone marrow starter delicious and roast chicken from spit superbly moist. Thoroughly enjoyable, looking forward to next visit. I went to the Jugged Hare on a friend's recommendation, and I have to say it didn't disappoint. I absolutely luuuurrrve this place. It has a great atmosphere, fab food and is just that wee bit 'quirkily' British. In fact it kind of takes us back to what made Britain famous for it's pub culture - but only in a good way. The food is fantastic - unapologetically meaty - and the service great. A couple of dishes we tried were the wild boar sausages and the rib-eye with Bearnaise. Both delicious. There are some unusual things on the menu too which were surprisingly good. Squirrel can you believe??? They certainly made a talking point anyway, adding to the experience, which I can only say was altogether top class! A family sunday lunch in the Jugged Hare was fantastic treat. My wife had booked it and I wasnt sure what to expect. We had a great afternoon. The staff were lovely looking after both my wife and I and also entertaining the children. We opted for the roast leg of mutton with all the sunday garnishes, it was the best roast I think I have ever had at a restaurant. This was followed quickly by Sea-buckthorn junket, which didn't dissapoint. We enjoyed a good couple of hours here, the children were welcomed, the food amazing and the service was outstanding. We will be back! Although the term gastropub is in itself quite an obnoxious term the attitude of the Jugged Hare is anything but,The bar staff are absolutely brilliant, and good natured about all that they do, although not entirely well supervised, the bar food is excellent, the scotch eggs being a favourite dish. Given that every other review I've read for the Jugged Hare has been excellent, we must have gone on a really bad night. The fish was as dry as a bone and luke warm, the mashed potato that went with it was also luke warm and very oily. It turned up so quickly, I can be assume that the food had been sitting prepared in the kitchens for a long time. Service was mediocre, the chocolate desert was nothing special and the bill for the meal was absolutely extortionate for what it was. There is no way either of us would go again. Had high hopes from the review and first impressions upon arriving. Venue looks great. Classy decor. Starters: friend had the crab which was good. I had a goats cheese salad drowned in dressing. Mains: we both had rump steak. Both were over-cooked. Mine drastically so. Presentation of dishes was very nice. Service wasn't rude, but gave the impression of not really caring and was consistently forgetful (had to ask again for things a number of times - they weren't busy). Style over substance. Was never asked if everything was OK. At the prices you're paying, these basic mistakes are unforgivable. Wouldn't return. Sunday roast lunch - nice atmosphere, good service but the food is the reason we came after the recent review on this website. Presentation very good, but was served luke warm, especially the vegetables. Roast potatoes not crispy or fluffy, using the wrong type of potatoe. Charged extra for ice cream with treacle tart, very mean with their desert portions. Shame as far too expensive, paying for the Harris tweed waistcoats that the waiters wear, then the actual meal. A nice atmosphere with slightly hit and miss food. Coming in at nearly £50 a head, the Jugged Hare is aiming a bit too high. The starters, wine list and service were good, (in fact the crab starter was excellent) however both mains were over cooked and they have inherited the terrible bread from Chiswell Sreet Dining Rooms. These details would not be a problem in a simple pub but this far too expensive to be viewed as such.